Should You Pay $250 To Play This Casino Game? Before we get to the new puzzle, let’s return to last week’s. Congratulations to 👏 Dan Katz 👏 of North Attleboro, Mass., our big winner. You can find a solution to the previous Riddler at the bottom of this post. Now, here’s this week’s Riddler, which comes to us from Riddler Regular Laura Feiveson, an economist at the Federal Reserve’s Board of Governors. Suppose a casino invents a new game that you must pay $250 to play. 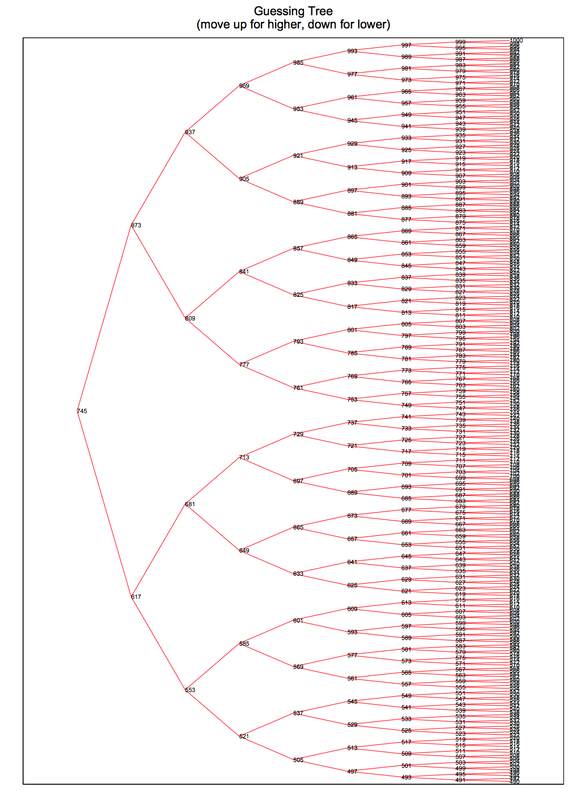 The game works like this: The casino draws random numbers between 0 and 1, from a uniform distribution. It adds them together until their sum is greater than 1, at which time it stops drawing new numbers. You get a payout of $100 each time a new number is drawn. For example, suppose the casino draws 0.4 and then 0.7. Since the sum is greater than 1, it will stop after these two draws, and you receive $200. If instead it draws 0.2, 0.3, 0.3, and then 0.6, it will stop after the fourth draw and you will receive $400. Given the $250 entrance fee, should you play the game? Specifically, what is the expected value of your winnings? And here’s the solution to last week’s Riddler, concerning a mysterious man and an envelope full of money. A robust 42.8 percent of your submissions were correct. The solution is adapted from that of Dan, this week’s winner. When given only nine chances to guess how much money is in the man’s mystery envelope, your first guess should be $745. There are two key ideas here: 1) If you’re ever making your final guess and are unsure of which of multiple options is correct, you should always choose the highest one, since it has a higher expected value. (It has the same chance of being right as other options, and it gives you more money if it’s right.) 2) If you have one guess, you can only be sure of winning if you have one option left. Two guesses will allow you to win with three options: Pick the middle amount of the three and then, if it’s wrong, the man telling you “higher” or “lower” will guarantee you can win with your last guess. In general, using the strategy above, if you can win M options with N guesses, you can win 2M+1 options with N+1 guesses. Thus, by induction, you can win a (\(2^n-1\))-option game with n guesses. Thus, with nine guesses, you can win a 511-option game with certainty. Unfortunately, we have 1,000 options, but generalizing Idea 1, we’re best off making all our ensured wins as large as possible. So pretend the numbers from 1 to 489 don’t exist, and use Idea 2 on the numbers from 490 to 1,000. You’ll lose 489/1,000 of the time, but that was going to happen anyway, and this strategy ensures that the situations where you lose are the ones where there was the least to gain. 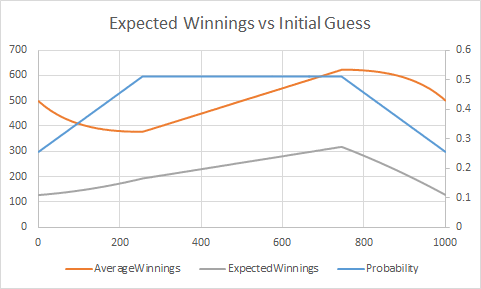 Thus your first guess should be 745 (1,000 minus 255, which is smack in the middle of your 511 options), and your expected winnings will be $380.695 (511/1,000*745, since 745 is the average value of the amounts you might win). Thanks, as always, for an inbox full of rich, charty goodness. Have a wonderful weekend!